Bananas Deserve A Bunch More Respect! What’s more American than apple pie? It’s that familiar yellow-skinned fruit that, well, we all go bananas over. 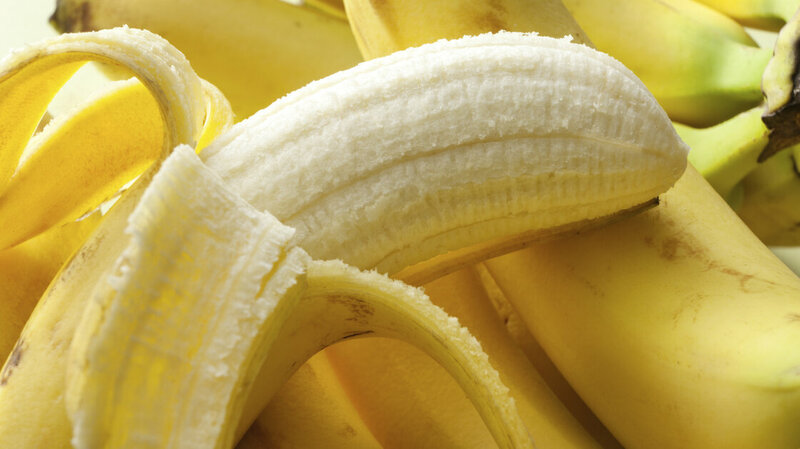 Americans down more bananas than any other fruit — in fact, about 25 pounds a year, according to the Census Bureau. In fact, most of us have been die-hard banana enthusiast since childhood when, afflicted with food allergies, bananas were one of the few fruits we could eat. Although bananas are creamy, delicious and full of nutrients such as potassium and vitamin B6, the tropical fruit suffers from a persistent image problem. Indeed, most of us take the banana for granted. They’re what you slice onto your breakfast cereal. They’re available all year round — an inexpensive food item that can’t seem to match the allure of today’s more trendy fruity offerings, such as the pomegranate or the goji berry. But what’s best about the banana — which is a seedless berry, not a fruit, and the up-to-25 foot high “tree” is actually a giant herbaceous plant — is its versatility, especially when it comes to cooking. Indeed, there are a lot more things to do with bananas than peeling and eating them. Bake bananas into that old bake-sale standby banana bread, moist and fragrant and studded with nuts and raisins. But don’t stop there. Need something to enrich your pancake batter? Fold in some sliced bananas with blueberries or peaches. Or layer them in a cream-laden custard for a decadent banana cream pie. Then there’s fritters, where the crunchy exterior plays off the molten bananas within. Swirl them in a blender to make daiquiris, and puree them in your morning smoothie for a dash of richness. Are bananas fattening? You be the judge: A medium banana has 105 calories, but because of their rich taste and high fiber content, you feel full after eating one. It may now seem far-fetched, but the banana was once considered wildly exotic. First cultivated in ancient times in Southeast Asia, bananas arrived in Europe in the 15th century. Until the late 19th century, the sunny yellow fruit was virtually unknown in the U.S. When bananas did arrive, they caused a huge sensation. At the 1876 Centennial Exposition in Philadelphia, the display of towering banana plants was so popular that a guard was posted to keep gawking fairgoers from pulling it apart for souvenirs, writes Virginia Scott Jenkins in Bananas: An American History. It wasn’t long before bananas — hundreds can hang from a single tree — became cheap and abundant. Their popularity meant that large U.S. growers, gobbled up land in Central America to expand their plantations to meet the growing demand. During the early 20th century, the U.S. intervened several times in order to support these economic interests. This is when the term “banana republic” was coined to describe a corrupt dictatorship whose government was controlled by American growers. Today, Americans mostly know only one variety of bananas — the Cavendish. That’s the familiar sweet or dessert banana. But there’s also the plantain, or cooking banana, with its higher starch content. Beyond that, more than 1,000 red, blue, even black bananas with varied tastes and textures grow throughout the tropics, from Africa to South America. But the familiar, reliable Cavendish is in trouble. A virulent fungus, which killed off the Gros Michel, an earlier common banana variety, poses a threat to the worldwide crop. Is there a danger that the banana Americans love could become extinct? It would “take a long time” before that happens, and hopefully they’ll find a replacement variety. When it comes to storing bananas, as just about everyone knows, they typically start out a bit green, then turn a sunny yellow. After a few days, they develop brown spots, but that’s when they’re perfect for baking or folding into smoothies for dessert or breakfast — and that’s a great way to give the humble banana its due. « USDA & THE WHITE HOUSE PROPOSE CURBING JUNK FOOD MARKETING IN SCHOOLS.